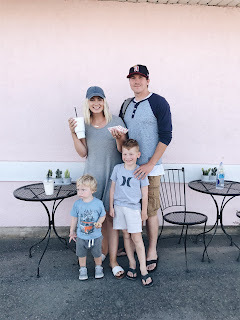 I can't believe that through 3 babies and all the time I have blogged over the years that this will be my first official birth story I share. How cool! I love reading people's birth stories and even spent the later part of all of my pregnancies watching videos and vlogs of births online. Personally I feel like birth is so beautiful and amazing. I feel in awe that the human body is able to do it and heal itself after wards. I have had 3 different birth experiences and each has been so incredibly special to me and a day that I NEVER will forget. 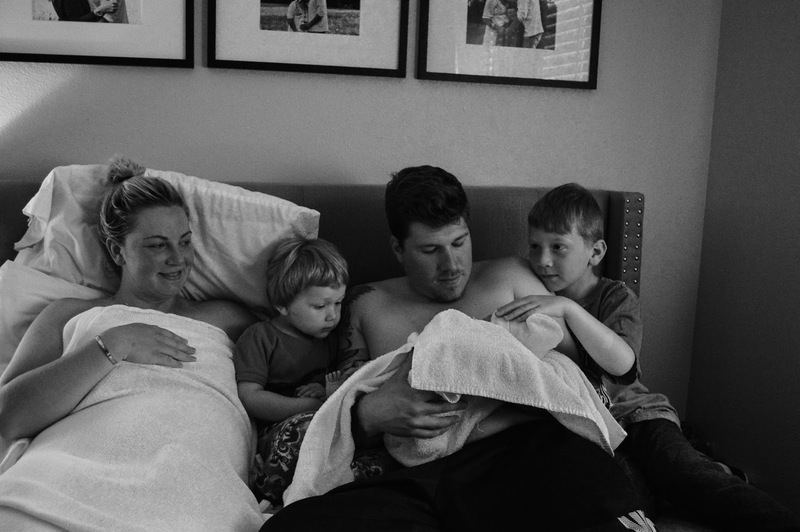 Here is the story of our 3rd son's arrival! Wednesday June 27th I was officially a week and a half "over due" and at my emotional limit for waiting for this surprise baby. Tuesday night I finally broke down and cried at my moms house! My body felt so sore I hadn't been sleeping for weeks and I just felt so much more tired and heavy with each day. I kept waking up every morning thinking this could be the day and had to emotionally psych myself up and then be let down. Almost 2 weeks of emotional roller coaster I almost felt like he would never come! I went to bed that night thinking okay tomorrow HAS to be THE day. As soon as my midwife arrived they started setting up and she did a cervix check on me. Effaced and at a 6! By 7am the pool was almost ready, my sister was taking pictures, my mom and Dylan supporting me through contractions and my step dad on duty for the boys. I basically had my head on the couch and couldn't get up because the contractions were coming pretty quickly. Krew and Dash were still asleep in their room and I wasn't sure what time they would wake up and how far along I would be so I was so grateful to have my step dad there for support and help with the boys. At around 8am I was at an 8 and we decided to break my water to get things going and try to have the baby just before the boys would be waking up. To my surprise they woke up around 830am and came out of their room. I felt a little anxious at first because I was at the point that I couldn't really talk and baby was about to come and they wanted to come say hi, but I am so glad that they did. Krew is a rock star and was totally fine but I was so worried about how Dash would react. Thankfully he was like "Hi mama hi mama!" He was kind of confused and excited but not scared. Things were super intense so my dad took Dash for a little walk around the house to keep him preoccupied because at that point I was head down ready to have a baby and making some intense sounds haha. Baby boy was born quickly after that at 846am! ( about 20 minutes after boys woke up) Dylan was able to "catch" him with the help of our amazing midwife and Krew was able to watch his 2nd brother be born. Beckham kind of shot out with open arms and legs and everyone was so excited and yelled "it's a boy!!" I was able to turn over and Dylan handed him to me. My dad brought Dashy in right after that and it was so funny he came over to the pool and was like "EWW!" He thought it was so funny to say Ew but was so excited there was a new baby and gave me a high five haha. I was so happy the boys were both there and that they handled it so well. 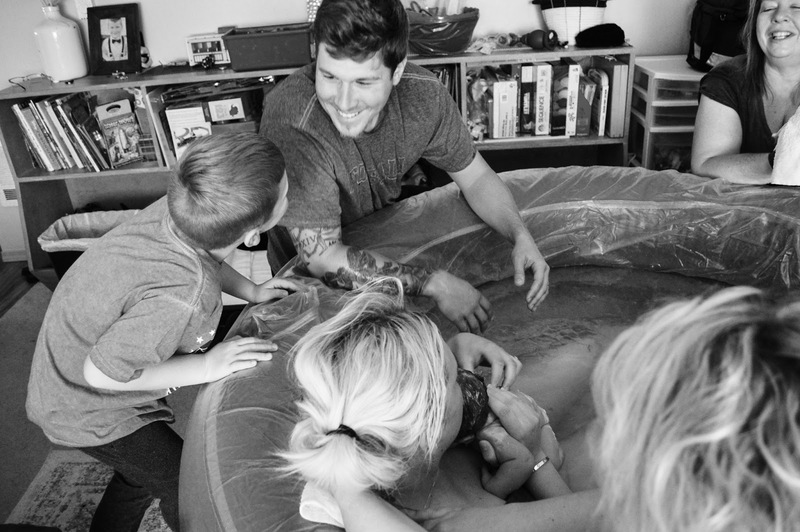 Home birth is really laid back and has such a good vibe I think if you're comfortable with it it's an amazing experience for kids and families to watch. 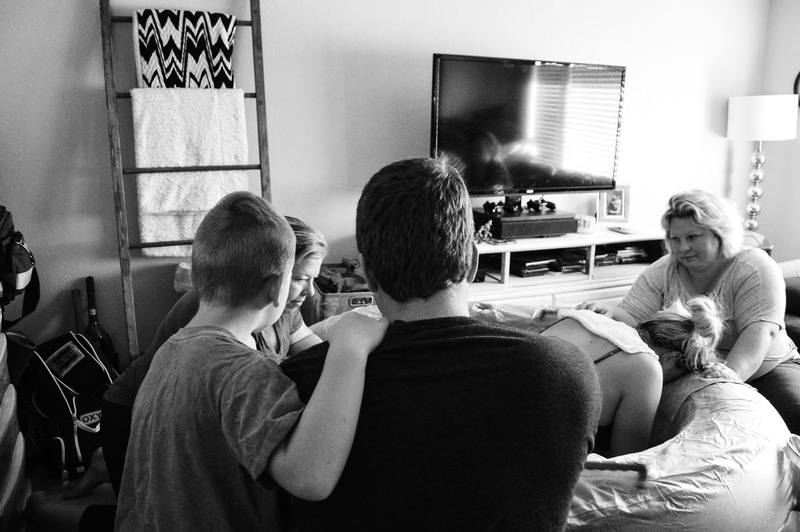 After Dylan cut the cord he was able to take baby boy over to the couch and do skin to skin with him and the big boys as I got help out of the pool and to our bedroom. All my post partum care is done right there at home as well. (beds are lined with waterproof liners and extra sheets and pads as well) I got into bed and immediately got warm blankets placed on me and Dylan and the boys all came in and got on the bed with me. Baby boy weighed 8lbs 12oz and 21.5 inches, exactly in the middle of both his brothers' weights! 14 is our lucky number so Dylan was ecstatic when his head and chest measurements were 14.5 inches. Proud daddy! Dylan and Krew were able to put his first diaper on and little jammies and then I was able to nurse him in bed right away. By noon everything was picked up and we were settled in our room admiring our sweet babe and welcoming the grandparents to come see him. It was probably my "easiest" and quickest birth and I am so so happy with our experience as a family and how truly special it was. I have talked about this before but my midwife has made the biggest difference in the world for us and Dylan and I agree we don't know what we would do without her. She has taken the absolute best care of our family and we trust her with anything. She has helped me bring 2 babies earth side naturally at home with no tearing and an amazing recovery and we are just so grateful for such a great experience and amazing care. We love you Ann! I have felt so great recovering from this birth. Beckham is just the sweetest baby boy and has done so well with nursing and his brothers loving all over him. We still can't believe we have 3 healthy beautiful boys it's so awesome! The last few days have flown by and I still feel kind of in that newborn haze but it's such a blessing and I just want to cherish every minute because with each baby I have had I recognize how important and special these days are. Im not even bitter to be up all night with this babe because I am truly just so grateful to have him. Dylan is still home till later in the week and has been a super hero dad. He's been busy getting the boys out of the house, doing dishes, laundry, and helping with baby boy. I am so lucky to have him and my mom around their love and support has been everything. My midwife Ann, and her daughter who assists her, Alyssa. Thank you so much for all your sweet and kind words about our baby boy. 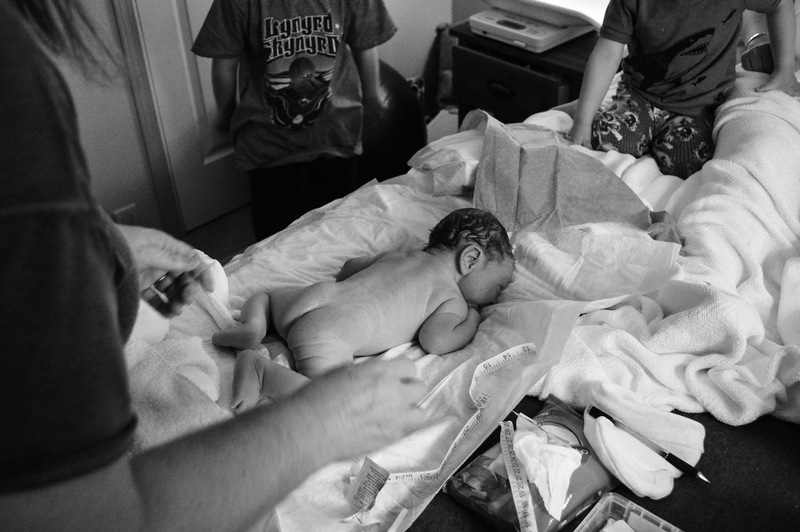 Sharing this is deeply personal and I debated sharing some of these photos but I think it's something to be really proud of and to help other women know that you can have an amazing birth experience and have a lot of control over how it goes. I wouldn't ever say the way I chose to birth is the only right way but I love to share how it doesn't have to be scary and how with the right care provider it can feel like something you look forward to and feel completely educated about. A lot of women have been really curious and asked me more about natural birth and the safety of delivering at home. 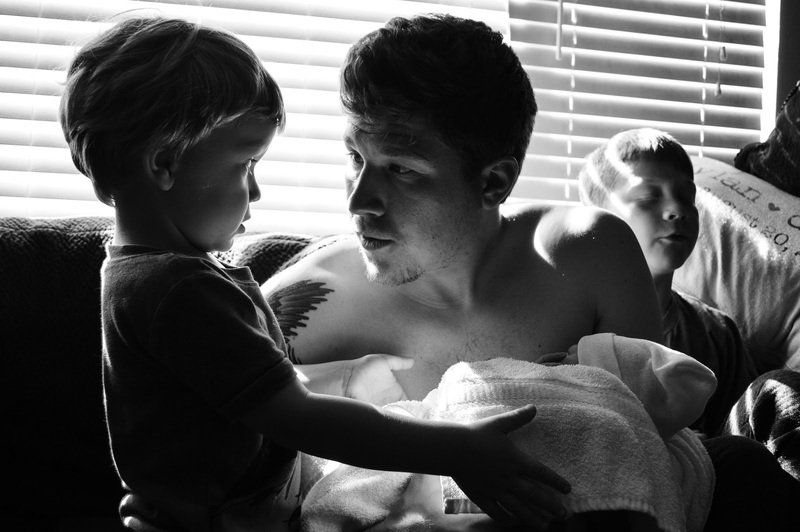 I love to talk about this because a little education on this topic changed my entire views of birth and labor and ultimately the way Dylan and I chose to bring our babies to the world. Please feel free to ask any questions about it! I'm so grateful that I am a low risk and full term carrying mom which made it possible for me to have this type of experience and for the amazing care of my midwife. Having a baby is hands down the best thing I've experienced in my life. *About his name: We only had the name Beckham in mind for if we had a boy. We really had the hardest time coming up with boy names that felt right or went with our family. There were many I liked but felt like didn't fit. Once he was born it just stuck and we never really had any other name options! We kind of worried about it being too trendy but we felt the nick name "Beck"would be perfect with "Krew" and "Dash". His middle name is 100% named after Drew Brees and yes Dylan picked that and was super proud haha. *All photos were taken by my awesome little sister Shelby!